Looted Ferguson bakery gets crowdfunded donations to rebuild. 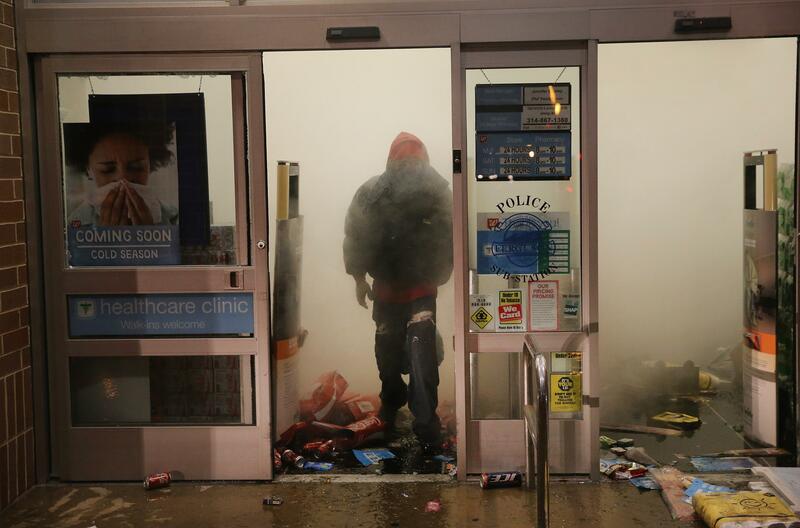 A looter walks out of a burning store on Monday night. DuBose began calling her customers to tell them the news, and then started baking to remake the lost orders. The Ferguson community pitched in to help. A friend, suggested DuBose set up a crowdfunding site to take donations the help rebuild. The response was overwhelming. In just days, DuBose received over 5,000 donations amounting to over $170,000. My shop, which had it’s grand opening this summer was vandalized in the riots. My main windows were smashed and bakery damaged. I’m beside myself, but with the holidays, can’t stop working. I’m very busy cleaning and trying to repair my business. I’m also trying to catchup on baking cakes for Thanksgiving! I promise to update this later. I’m truly mixing batter right now. I began baking and selling cakes at local flea markets, slowly saving money to start my small business. I LOVE TO BAKE !!! It was my dream and I’m working hard to accomplish that dream… It was suggested that I start this account by a new friend and here it is. I do need help to rebuild and create a website, so any donations would be a huge assistance. I’m not sure where to find the money to repair my little bakery. But, even if you just stopped by to say hello. Thank You !!!! I’ve never felt such love.